Over the last decade, neurobiology has been focused on the functioning of neural networks rather than single nerve cells. It is at this level that the key functions of the brain are performed, including processing, storage and transmission of information. However, researchers are facing some methodological difficulties in the investigation of neural networks. Traditional methods such as those aimed at studying the electrical and metabolic activity of single neurons do not provide any insight into a network's architectonics or its functional features. Commonly used methods such as enzyme-linked immunosorbent assay (ELISA), polymerase chain reaction (PCR), or classical biochemical methods are not applicable to the study of neural networks, since they do not allow experiments on live cells (biological samples must be fixed) and lead to the destruction of the bonds between the cells. Scientists at the National Research Lobachevsky State University of Nizhny Novgorod have now successfully used and optimized a method to determine the level of mRNA expression in living, actively functioning cells. This method is based on the use of gold RNA probes developed by Merck, Germany. 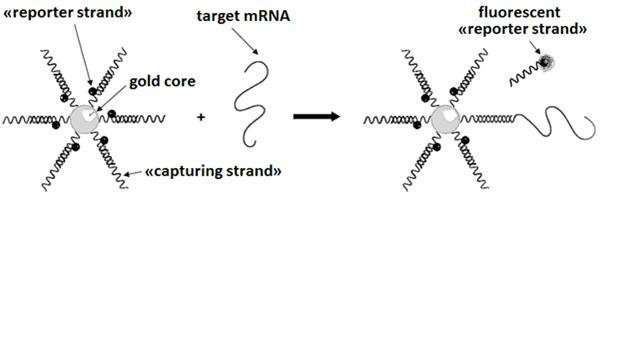 Due to their small size and exceptional properties, the RNA probes easily penetrate the cell and are capable of fluorescing after specifically binding to the target mRNA. The mRNA visualization is carried out by microscopy and does not require additional manipulations for the experimental sample preparation. From the level of mRNA expression, researchers can judge about the activity of protein synthesis in the cell, both in the normal state and under the influence of various stress factors. According to Maria Vedunova, Director of the UNN Institute of Biology and Biomedicine, the use of RNA probes in combination with calcium imaging, a method for determining the metabolic activity of neural networks, made it possible to investigate the activity of those cells in the network where the mRNA units of interest to researchers are synthesized. "This complex of methods allowed Nizhny Novgorod scientists to make progress in the development of new approaches to protecting brain cells during hypoxia. The approach is based on the use of brain-derived neurotrophic factor (BDNF) and glial-derived neurotrophic factor (GDNF). These signal molecules are synthesized in the human body and regulate the differentiation of nerve cells, the growth of neuronal processes and the formation of contacts between cells (synapses)," explains Maria Vedunova. It has been shown in this study that during hypoxia, BDNF and GDNF inhibit nerve cell death and maintain neuronal viability. Some features of the molecular mechanisms of neurotrophic factors' action in hypoxia were revealed, as well as the influence of one neurotrophic factor on the expression level of the other one. Thus, it has been proved that RNA probes provide an informative method for neurobiological studies and open new prospects for studying the mechanisms of brain functioning in normal conditions and under unfavorable effects of stress factors.